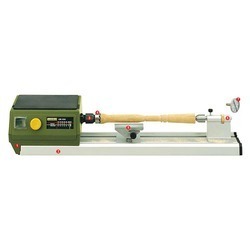 Wooden Lathe machine is used to turn wooden rods into profiles or simple cylindrical bars. We can even sand or finish the wood rod being made using this machine. Any wood workshop or factory should have one of the machine. This machine can be provided on custom design requirements also. Our organization is counted among the distinguished manufacturers, suppliers and exporters of Wood Turning Lathe Machines. 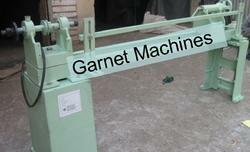 These attractive designed machines are steel constructed along with heavy cast iron feet by the professionals. We offer these machines to the customers at industry-leading prices. Length of bed: 1370 mm/54" - 2635 mm/96"
Height of centres: 165 mm/6" - 203 mm/8"
Width of bed: 215 mm / 8"
Our company is counted among the most reliable Wood Turning Lathe manufacturers, based in India. The materials employed in the manufacturing of the wood turning lathe are of superior quality that further ensures high durability and resistivity to various conditions favoring corrosion. We are a remarkable entity in this domain, engaged in offering a stunning array of Wood Turning Lathe.